Four residents of a Belgian garden needed some help . An odd couple, an alert Scottish terrier and a lethargic angel were being ruined by stains. 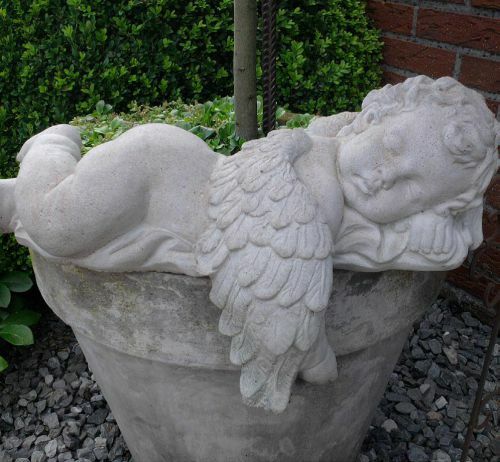 The owners of the concrete statuettes requested that their beloved garden figurines be cleaned with Oxy-Klenza™ and sealed with STAIN-PROOF Original™ to keep them looking their best. Our case study page is one of the most visited on our website. Every case study we publish is permanently located there. If you would like to promote your company with a job that you have recently completed using a product from the Dry-Treat range, email marketing@drytreat.com with your name and phone number. Please put 'case study ' in the subject line. Include a description of the project with some great quality images. 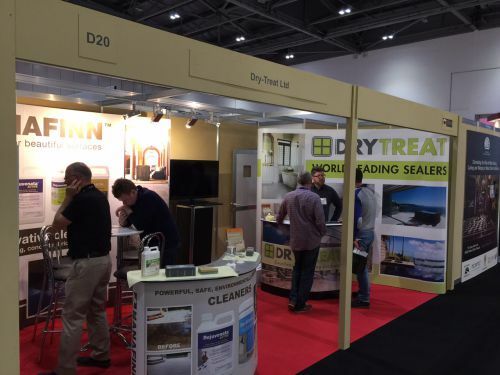 Dry-Treat exhibited at the Natural Stone Show in London last month. The 3 day event attracted visitors from UK, Europe and across the world. Onlookers were eager to find out more about the Dry-Treat range. A big thank you to everyone that came past! 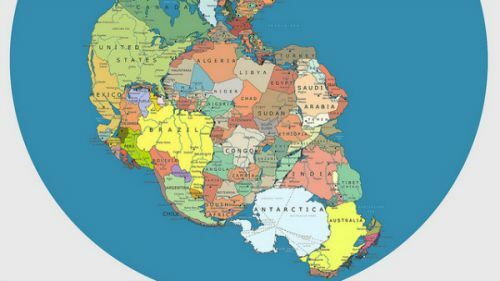 Research sponsored by UNESCO and the International Union for Geological Sciences claim that Europe, the Americas, Asia and Australia will join together to form one supercontinent. The international team of scientists have discovered that this supercontinent cycle is caused by the Indian Ocean widening by a few centimetres each year and the Pacific Ocean narrowing at a similar rate. In 100-200 million years these massive geological forces may result in entire cities being reshaped. Dry-Treat Head Office is already planning for the possibility of dealers having to re-locate. Rest assured our website will be updated when the supercontinent forms. The nature of the stone industry often means weird and puzzling problems are a common occurrence. A recent customer query this week is one such example. The owner of a sealed bluestone floor discovered strange marks on some tiles that kept re-appearing. The stain looked like water marks but there was no obvious source inside the home. After a few days the culprit was unmasked as the family dog! The stains were actually caused by saliva not a mischievous poltergeist. It’s a reminder for all animal owners to be diligent about their mess as well as yours! Apart from offering part time investigative work, Dry-Treat also makes a cleaner for all types of indoor cleaning. 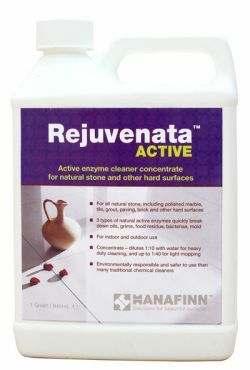 HANAFINN™ Rejuvenata ACTIVE™ contains 3 natural active enzymes that quickly break down oils, grime, food residue, and mold stains. Rejuvenata ACTIVE™ is effective for heavy duty cleaning and stain removal, including those caused by a beloved pet.